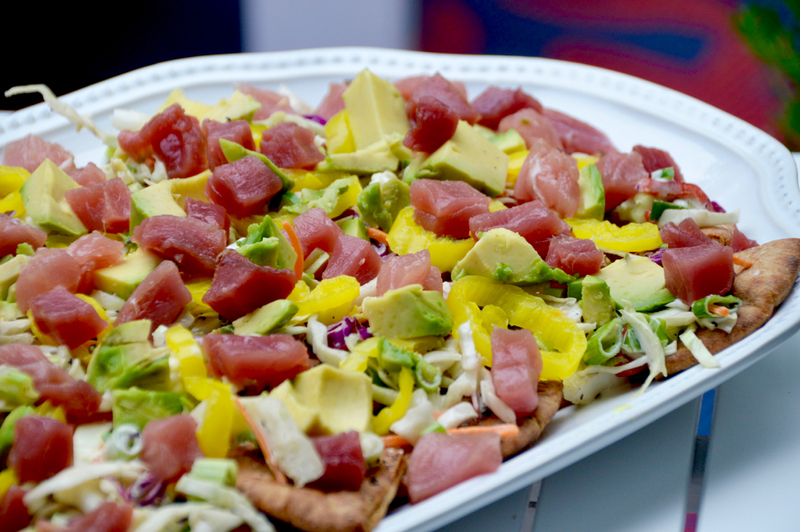 These Ahi Tuna Nachos with Firecracker Slaw is a shoutout to my past life living in Wellesley Massachusetts. One place I miss the most is a restaurant called The Cottage, which served up tuna nachos so well I would eat it for breakfast, lunch and dinner if I could. It's been a solid year now since I've sat down at that restaurant to enjoy a plate of ahi tuna nachos, and my cravings for them are unbearable! So of course when Ryan brought me home four huge ziplock bags of tuna steaks, you better believe some of that was turning into tuna nachos. 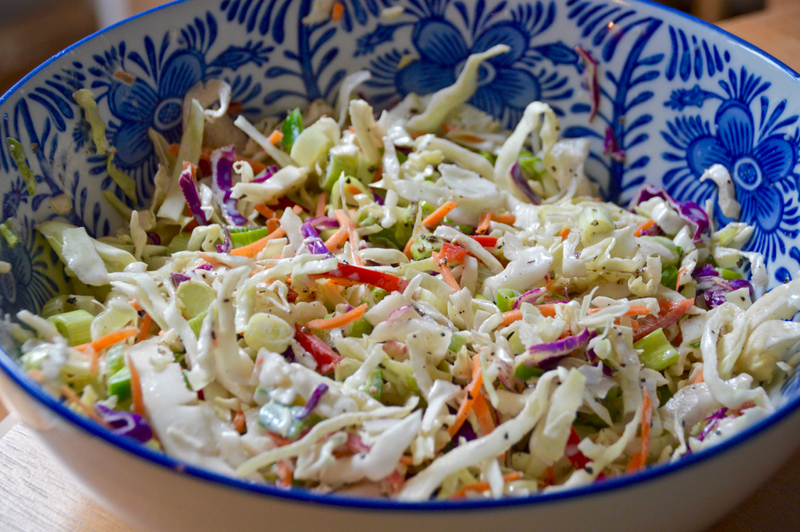 The firecracker slaw is yet another shoutout to my old roots in that town. The Whole Foods up there used to make a firecracker slaw that they sold in the deli section that was out of this world yummy. I used to eat that slaw as my salad for lunch! I used homemade pita chips for this as well, because why not?! Wonton crisps would have been my first choice, but the thought of deep frying a bunch of wontons wasn't all that appealing. By all means try it out, but the pita chips worked just as well and held up really nicely to the saucy firecracker slaw. I topped it with some pickled banana peppers for color and an extra kick of flavor, and of course added some diced avocado to cool things down when the spice really kicks in. These are so easy to make, and they slaw can be stored in the fridge for a few days too, making this an easy make-ahead recipe too! You can even make the chips a day ahead and store them in an airtight bag on the counter. If you are buying tuna for this dish, be sure to find wild caught, sushi-grade tuna. It will be a dark red color. This was from a bigeye tuna, but you can also buy yellow jack or bluefin for this. If I am ever buying tuna steaks to eat raw, I always ask the fish monger how long ago the fish came into the shop and was it frozen and then thawed to sell. 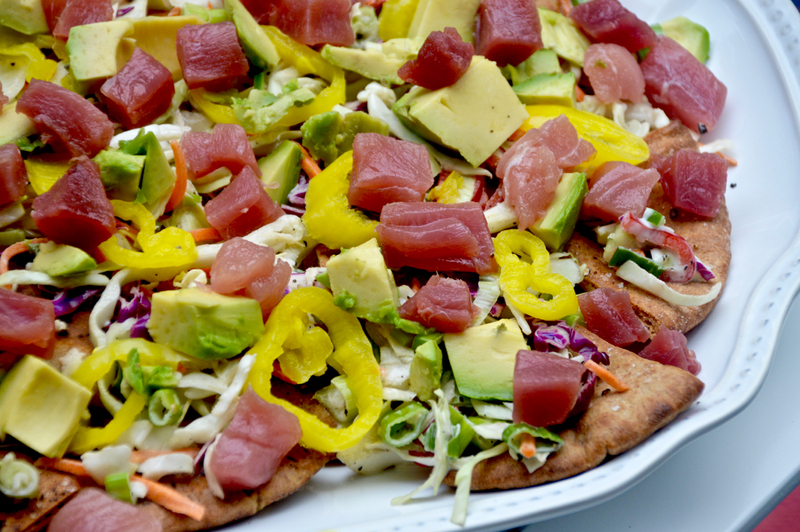 There are no real measurements for how much tuna, banana peppers, avocado or slaw mix you want on the nachos. Just make sure to follow the directions for how to make the slaw, then be your own judge as to how you want to make your nachos. Preheat the oven to 400 and line a baking sheet with tin foil. Quarter the pita rounds, then brush both sides with olive oil and a sprinkle of salt. Bake pitas in an even layer on the baking sheet for 12-15 minutes, or until they are crispy. Set aside to cool. In a bowl, combine cabbage and carrot mix, scallions, mayo, chile, jalapeño, vinegar and sugar. Stir to combine, then add salt and pepper to taste. Set aside. Arrange the pita chips on a plate, then use a slotted spoon (to get some of the juices from the slaw out) to spoon the slaw mix over the pitas. Next top with banana peppers, then the diced tuna, then the avocado. Serve immediately. Store any leftover tuna in an airtight bag in the fridge and the slaw in a tupperware container in the fridge.